Also known as "devil chasers" and various traditional Filipino names. 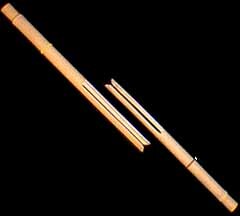 This bamboo instrument is from the Philippine Islands and can be played in ensembles where each player has one stick and plays interlocking parts. People will also use this instrument when they go walking out to a field to scare away animals that might be ahead of them. Played on the palm or knee, the bamboo makes a buzz sound because of a small crack that goes most of the way down the instrument. A small hole near the bottom is covered and uncovered by the thumb to produce a wah-wah effect.